If you want to have a healthy beautiful smile to last your lifetime, you need to practice good oral hygiene. While most people think they do a fairly good job at caring for their teeth and gums, the truth is, most people make simple mistakes. These simple mistakes can eventually lead to a number of oral health complications, such as tooth decay and gum disease. As your family dentist in Lakewood near Dallas, we have the easy but effective oral hygiene tips you need to protect your smile. 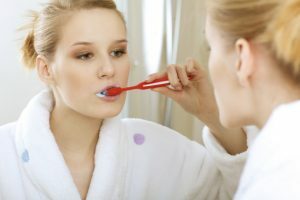 You’ve already heard that you need to brush your teeth at least twice a day, but are you brushing your teeth correctly? If you aren’t brushing your teeth correctly, you’re leaving bacteria along the gum lines. If the bacteria aren’t removed, you’re allowing the bacteria to accumulate, which will cause gum disease and tooth decay. To brush properly, you need to hold your tooth brush at a 45-degree angle and use a back-and-forth and up-and-down motion. Clean all surfaces of the teeth, including the backside. Pay careful attention to cavity prone areas, such as the back molars. Don’t forget to brush the tongue and cheeks as well. Ideally, you want to brush for 2 minutes per sessions. Too many people underestimate the importance of flossing. Flossing removes the bacteria from between the teeth that brushing can’t reach. You need to floss your teeth at least once a day using dental floss. Use about 18 inches of floss so you can floss comfortably. Insert the floss between each tooth in the shape of a C. Extend the floss down to the gum line and then backup to the top of the tooth. While proper oral care plays a large role in the health of your teeth, there are certain factors that will damage your teeth despite oral care. There are numerous lifestyle factors that will negatively impact your oral health. Not to mention, certain foods and drinks are proven to cause tooth damage. You need to avoid lifestyle factors that can damage your teeth, such as tobacco use. Limit your contact with cavity-causing foods and drinks, like soda, coffee, and alcohol. Healthy teeth and gums start with a good diet. You need to ensure you’re consuming adequate amounts of calcium and vitamins for a healthy mouth. Eat a variety of heathy foods, such as dark, leafy vegetables and dairy products. The health of your teeth relies on your intake of Calcium, vitamin D, and vitamin B complex. In addition, you need copper, zinc, iron, iodine, and potassium. In addition to home care, you need to visit your dentist in Lakewood near Dallas at least twice a year. We provide the routine cleanings and checkups you need to keep your mouth happy and healthy. We offer preventative care to stop damage before it starts and restorative procedures to correct any damage that has occurred. Together, we’ll give you a long-lasting beautiful smile with the proper dental care.